Of the many books that have been written by men who fought in World War II, many were first hand accounts of engagements they had participated in. There were many stories of hard fought battles and of unbelievable heroism from these men. Their stories cannot and should not be disparaged nor taken lightly ¾ they were the real heroes. But we must remember, for every man at the front engaged in battle, there were eight of us in the rear seeing that he had the necessary tools of war as well as making sure that he was taken care of in the event that he should become a casualty. I was part of those service troops. In this country in 1940, the United States Congress felt that war in Europe was imminent and our country must be prepared for any eventuality. 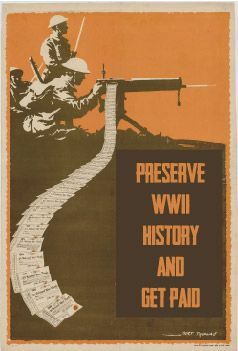 Every county in every state was instructed to set up a draft board to classify all single male residents between the ages of twenty-one and thirty-eight as to their eligibility of serving their country in a time of national emergency. A lottery system was inaugurated and each potential draftee was assigned a number. It wasn’t long before I received a card stating that I was classified 1A and could be called to active duty at any time. I was unmarried with no dependents and of the right age. I was operating my own poultry farm near Walkerton, Indiana at the time, having moved to the farm from Chicago in 1938. In the spring of 1941, I received an induction notice from the Marshall County Draft Board stating that in order to meet the government’s quota for men to serve, it would be necessary for me to be at the railroad station in Plymouth, Indiana at 9 AM on April 14, 1941. My services in the armed forces would be required for one year and for me to get my affairs in order to comply with this demand. As there was no way to avoid this turn of events; the livestock on the farm was sold and the truck and other farm machinery were stored in the chicken house to await my return, which I assumed would be in one year. It would be four and a half long years later before I could return to that poultry farm in Marshall County, Indiana. At the time I received my induction orders, I resented being one of the first to be called as I felt that I could do more good for my country on the farm instead of in a military uniform. In retrospect, I was fortunate to be one of the early draftees as I was given the opportunity to become an officer in the Army Corps of Engineers. If I had been drafted after the start of hostilities, I would not have been able to select the branch of service I preferred. I surely would have been assigned to a combat unit and sent to one of the many battlefronts that were in dire need of fighting men. When I received my draft notice in the spring of 1941, I was the ninth draftee from Marshall County to be called to serve. Twenty-seven of us draftees met at the railroad station in Plymouth on the morning of the 14th of April 1941. Our unknown destination was to be the induction center at Ft. Wayne where we were given a thorough physical examination to determine if we were qualified for military duty. After the examination and several shots in the arm, we were sent on to Fort Hayes, Columbus Ohio, for further processing. 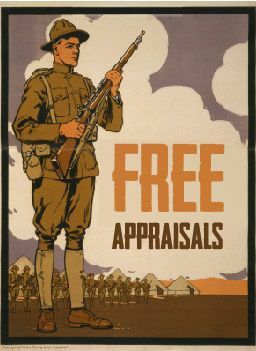 Here we were issued woolen GI clothing, mostly of World War I vintage and other personal necessities that we might need for our 12-month tour of duty. After being indoctrinated into the army’s way of doing things and learning a few rules of war, our next journey was aboard a troop train bound for Camp Shelby, Mississippi. Here we were scheduled to join the 38th Division, a National Guard unit from Gary, Indiana that was being activated to bring it up to wartime strength. The country was mobilizing for war! Upon our arrival at Camp Shelby, I requested to be assigned to the engineers, as I wanted to learn more about building construction and the operation of heavy equipment. I figured that as long as I would be in the army for only one year, I might as well learn something that would do me some good after my obligation to my country had been fulfilled. I was assigned to Headquarters and Service Company of the 113th Engineers in Camp Shelby. When the company commander learned that I had played a trumpet in my pre-military days, he immediately made me the company bugler. Now, that was the last thing that I wanted to do ¾ blow a bugle! My objections were of no avail. After serving in this capacity for nine months, I requested a transfer to the regimental band. I felt that as long as I had only 3 more months of my enlistment to serve, I might as well do something I enjoy and give up my idea of trying to learn anything while in the army. In November 1941, my transfer to the band was approved. On December 7th, everything changed! The United States was suddenly and deliberately attacked by the naval and air forces of Japan. This act of aggression plunged the United States into World War II. Now we draftees could see why we were uprooted from our homes and our lives interrupted. There was a purpose for our being in the army. Our country had been attacked and must be defended. After being a member of the 113th Engineer Regimental Band for a few months, I didn’t care to fight the war blowing my horn and a new opportunity presented itself. In January 1942, a notice appeared on the band bulletin board stating that if an enlisted man had two years of college schooling, he could apply for OCS (Officer Candidate School). I immediately sent in my application and was accepted for training in the Army School of Engineering in April 1942. I was sent to Ft. Belvoir, VA and after enduring the rigors of study and training for 3 months, I became a “90-day wonder” and received a commission as a second lieutenant in the Corps of Engineers in the summer of 1942. Upon graduation 15 of us newly commissioned 2nd Lieutenants were sent to Camp Shelby, Mississippi to help activate and train the recently formed 350th Engineer General Service Regiment. In those days, the military had a policy of segregation whereby the races were separated into segregated units. The enlisted men in this regiment were black while the officers were white. After six months of military indoctrination and engineer training, our regiment received orders to ship out to the South Pacific in January 1943. We traveled by Pullman across the southern United States to our port of embarkation, Camp Stoneman, Oakland California and boarded an old Dutch freighter, the “Poleau Laut”. This ship carried our entire outfit consisting of 1220 enlisted men and 52 officers as well as all our engineering equipment including jeeps, dump trucks, bull dozers, road graders, steam shovels and truck mounted air compressors all down in the hold of the old Dutch freighter. At the time, we didn’t know where we were going and the ship’s captain received our destination orders only after we were a day’s journey out to sea. We only knew that we were going someplace where it was warm. We had turned in all of our winter clothing and replaced with lightweight khaki uniforms. After traveling a lone, silent, black out, zigzag course across the Pacific for three weeks, we disembarked in February 1943 at the island of Espiritu Santos in the New Hebrides to begin the long, slow trek to Tokyo. Our mission was to construct warehouses, hospitals, unloading docks and roads on the various island bases recaptured from the Japanese as America pressed on toward Japan. When we left the United States and traveling to our unknown destination, we all had mixed emotions as to whether we would ever see the Golden Gate Bridge again. Our country had been attacked and we had a job to do and we were going to do it, no matter what. The island where we had been sent was in the New Hebrides group just northwest of Australia. The battle for Guadalcanal, just to the north of Santos, was drawing to a successful conclusion. Espiritu Santos had been a French possession prior to the war and the main industry on this island was the cultivation and harvesting of cocoa. Our regiment was bivouacked in a large cocoa bean plantation and we set up our tents between the rows of colorful bean trees. The French plantation owners continued to harvest the crop all during our occupation. It was interesting to watch the natives slicing the huge, moist, bean pods, big as footballs, from the tree trunks and branches of the bean trees and stuffing them into large burlap bags to be hauled to the drying shed. By means of wood fires under a metal screen, the beans were dried and bagged for export to eventually be made into chocolate. After we were established at “Santos” for several months, I was riding around in my jeep one day and happened to pass by the living quarters of a Navy CB outfit that had preceded us to the island. At the rear of one of the navy enlisted men’s tents, I noticed a screened enclosure containing a few dozen tropical chickens of various parentages. Having been engaged in the poultry business back in the states, I was naturally curious about these birds. I immediately stopped my jeep to investigate and got into conversation with the owner. I explained my interest and inquired if I might purchase a few to enhance my own quarters with some live chickens, as I was getting homesick for the farm. He informed me in no uncertain terms that they weren’t for sale but, if I promised not to eat them, he would give me a couple. It was a deal and I was back in the poultry business with a rooster and two hens. As soon as I got the birds back to my quarters, I scrounged some feed from the mess sergeant consisting of oatmeal, corn meal and various other crumbled cereals that I thought would be attractive to poultry. In due time the hens started laying eggs in a hollow tree and after a dozen or so had been laid, their maternal instinct took over and they sat on the eggs continuously in order to hatch them. In three weeks time a flock of tiny chicks emerged. I continued to feed them and they were allowed to run loose around my quarters until the young ones were fryer size. About this time our regiment was split up and my battalion received orders to leave Santos and move north to Munda in the Solomon Islands. The second battalion remained behind on Santos to rejoin us later. After we had been on our new island for a month, the rest of our outfit caught up with us and I asked the recently arrived officers, “What happened to my chickens that I had to leave behind?” They answered by just smacking their lips and grinning. At least I kept my word and didn’t eat them so my conscience was clear. When we first arrived at Santos, I noticed the dark, moist soil and wondered if vegetables and flowers might grow in this tropical climate. As an experiment, I asked my parents to enclose a few vegetable and flower seeds in the airmail letters we exchanged every week. I needed something to wile away the long, lonely evening hours after our day’s work was done. In their next letter, my folks enclosed some tomato, radish, cucumber and zinnia seeds. In my off duty hours, I spaded up a small patch of fertile soil outside my quarters and started a small garden. In the warm, moist atmosphere of the tropics, everything grew abundantly. It wouldn’t be long before I would have quite a garden of half grown vegetables and flowers of various kinds. I was never able to stay at one base long enough to harvest the fruits of my labor but I guess someone else enjoyed them. I remember though, the zinnias would grow into huge shrubs and there was a continuous display of color as there was never a frost to curtail their growth. The flowers would bloom and the seeds would just fall down on the moist, fertile soil and start growing again. I can only assume that my zinnias are still growing on a few of the tropical islands in the South Pacific. We arrived at Munda in the Solomon Islands in the fall of 1943 shortly after the Americans had fought a terrific battle when they drove the Japanese from the island. As soon as we were able, five of us officers toured the battle area in a borrowed jeep in search of souvenirs. Evidences of the hard fought battle were everywhere including the foxholes where the skeletons of grinning Japs were still standing. The stench of death pervaded the area but time and insects had dissolved the flesh from the skeletons as the land was slowly reverting back to the jungle. I remember the Graves Registration personnel going about their gruesome task of digging up the American GI’s who had fallen in battle. They were to transport their remains to a more permanent resting place on the island. When a battle is in progress, the chaplain and his assistant, accompany the troops and it is their duty to bury the dead as soon as possible right on the spot where they have fallen. An inverted M1 rifle, with a bayonet on one end and a GI helmet on the other, is used to mark the temporary grave along with one of the two dog tags that each soldier must carry. The men recovering the bodies would locate the shallow grave and then gingerly slip their hand underneath the dead body to search for possible unexploded hand grenades that would be fastened around the waist of their fallen comrades. While I was on Munda, I was assigned to “F” Company whose mission was to provide lumber for the regiment in their various construction projects. We had our own sawmill that was shipped with us when we left the states. The sawmill was set up in the jungle several miles from the main base in order to cut trees that would be free of shrapnel. The tall stately trees consisted mostly of beautiful mahogany that was all of 3 feet in diameter at the base and fifty feet to the first limb. When the logs were transported back to the mill, they had to be gone over with a mine detector in order to locate any pieces of hidden steel shrapnel that could play havoc with the saw blade if not removed. Several times a day the Red Cross would drive out to the cutting area and serve hot coffee and doughnuts to the men which was always appreciated. There were 3 other officers beside myself in “F” Company so being off in the jungle and away from the rest of the regiment, we had to pass our lonely evening hours the best way we could. It was here that I learned to play contract bridge and found it to be a fascinating card game even to this day. Soon after arriving at Munda, I began planting numerous seeds around my quarters, as was my custom. The plants did quite well and I had a variety of vegetables coming along in various stages of maturity. One day the commanding general of the base, who was also a gardening enthusiast, strolled by my tent and observed my gardening activities. After consulting with my regimental commander, they inquired if I would be interested in establishing a quartermaster farm on the nearby island of Kolombangara in order to furnish fresh produce to the army hospital on the base. As we had been at Munda for six months or so and just waiting for orders to proceed to New Guinea on our way to Tokyo, I accepted the challenge. If you remember your history, Kolombangara was the volcanic island off of which President Kennedy’s PT Boat 109 was sliced in half by a speeding Japanese destroyer in the dead of night early in the war. England had owned this island prior to the Japanese invasion and the British planters had established a coconut plantation on a small section of level land. When the Japanese expanded into the South Pacific, they captured this island and built a fighter airfield to protect their larger bomber base at Munda, 5 miles away. It was my mission to farm this abandoned airdrome. 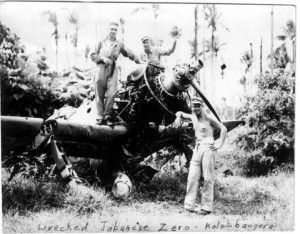 Instead of clearing the jungle with bulldozers, as the Americans would do to make a landing strip, the Japanese just cut the coconut trees flush with the ground in a swath 200 feet wide and several thousand feet long. The trees had been planted in a checkerboard pattern 20 foot X 20 foot and we had to plant our crops between the rows of underground stumps. I checked the personnel records of the enlisted men of the regiment and located a half dozen who had prior farming experience. In fact one of the men, I discovered, had a college degree in agriculture and had been a county agent prior to being drafted into the army. From our motor pool I was able to procure a small caterpillar tractor and from another, I scrounged a single bottom moldboard plow. The Red Cross was helpful in obtaining a variety of vegetable seeds from Australia and New Zealand. The US Navy furnished a small landing craft for transportation as the farm was 5 miles away by water. The British loaned the project 16 male natives so we were in business. The natives had their own canoes to go back and forth to their village on a neighboring island. They also brought their own hand tools in the form of hoes, axes and mattocks. In due course we began sending fresh produce back to the base hospital at Munda. Everything grew profusely because of the mild temperatures and high humidity. In fact it rained a shower or two every day. Our main export was watermelons and I often wondered what the wounded men in the base hospital must have thought when they were served such a perishable delicacy as a slice of ice cold watermelon as they lay recuperating from their war wounds. When the native helpers first arrived, I asked one of the educated men how do you say, “Don’t plant the seeds too close.” He rattled off something that I couldn’t understand and so I told him he better write it down and he wrote, “ Lopu lete va soku.” The natives would get quite a kick out of me trying to speak their language and they laughed like little kids whenever I tried to converse with them in their native tongue. The native workers had never tasted watermelons before and they enjoyed them as much as our men did. I demonstrated to them how to dry and save the seeds and then replant them in their own gardens back on their home island. I wonder to this day if the watermelons they are eating on the island of Kolombangara are the descendants of the ones that I introduced to the island in 1944. In 1945 we made our final move and this was to Hollandia, Dutch New Guinea. Here our job again was to construct warehouses, loading docks, roads and hospitals in preparation for General McArthur’s return to the Philippines. Humbolt Bay was a mass of ships of every description as America’s manufacturing might was getting ready to rectify the indignities of the fall of Corregidor three years earlier. Hollandia was a huge staging area where thousands of troops were brought together along with their war fighting machinery of every description. The island was soon covered with many roads as the vehicles were being assembled for the next invasion. The bare dusty roads consisted of red clay and the trucks, jeeps and tanks traveling 24 hours a day, soon converted the surface to a red dust that engulfed everything. It was impossible to keep anything clean. Our regiment anticipated going into the Philippines next but President Truman saved us the trouble when he ordered the atomic bomb dropped on Japan in August 1945 ¾ and ¾ home at last. Our job was finished! P.S. While I was in the army, I sent home over 300 V-mail, free mail and airmail letters to my parents living in Chicago. My mother presented them to me upon my return in October 1945. I carried this aging box of letters around with me through 50 years of married life, not knowing what to do with them. When I became interested in computers in 1991, I typed all of these letters into my computer as I felt they must be preserved for future generations to learn what my generation went through so they could live the good life they are living today. The Purdue University Press has published these letters and the title of the book is “Seeds of Hope”. It is available from amazon.com, barnesandnoble.com, borders.com or me. More of my wartime experiences can be viewed on the Internet by googling Sabel + watermelons. The old beat-up Liberty ship carrying us back to the states from Hollandia, Dutch New Guinea arrived in San Francisco Harbor in October 1945. As we descended the ship’s gangplank, there was no cheering crowds, parades or “Welcome Home” ceremonies of any kind. We straggled off of the ship one at a time carrying our few personal belongings. We were just happy to be home at last from the chaos that Hitler had created in Europe in 1939 and the Japanese at Pearl Harbor in 1941. It took me several weeks to become acclimated to the cool weather after spending the previous 2 ½ years in the South Pacific. Although the San Francisco temperature was in the 60’s and the local populace was running around in shirtsleeves, we recently returned veterans from the tropics, were shivering in spite of adding a few layers of additional clothing. Our first meal on US soil included gallons and gallons of fresh whole milk that we all craved. It was quite a treat to drink an unlimited amount of that refreshing beverage after so many years of the dehydrated variety. The next day I boarded a train bound for Ft. Sheridan, Ill. which is just outside of Chicago and was the separation center for the mid-west. I was placed on detached service as I had accumulated a number of months of unused leave because of my being overseas 32 months without a break. I didn’t receive my official honorable dis­charge until February 1946. In the meantime, Leona was on her way home to Bay City, Michigan from her tour of overseas duty in France with the Army Nurse Corps and was passing through Chicago. She wrote and asked me to meet her down­town at the Rock Island Railroad Station. I hadn’t seen her in 5 years so wasn’t prepared for the sight of the neat, trim, uni­formed 1st Lieutenant that greeted me. I was immediately smitten with the feeling that this was the woman that I would love to have with me the rest of my life. We had corresponded off and on for the past twelve years, both when I was on the farm and in the service, so we were pretty well acquainted. The next day I invited her to have lunch with me downtown in the Chicago Loop and popped the question, “Would you marry me and live on the farm?” When she replied with an enthusiastic “Yes”, we stopped at a jewelry store and picked out a ring. She stayed in Chicago for a few days with her cousin Elaine Johnson before returning to Bay City and we saw each other every night. Elaine’s marriage to my mother’s cousin, Walter Johnson, was how Leona and I first met 12 years previous in 1934. She was 16 years of age at the time and a junior in high school while I was 18 and had just graduated from Morgan Park High School in Chicago. We were paired off in the wedding procession. After Elaine’s wedding ceremony was over, Leona confided to her best friend that she had just met the man she was going to marry. Twelve years and a war interrupted the procedure that was ordained to take place. We were married in Bay City, Michigan on January 5, 1946 at Immanuel Lutheran Church. As we were both still officially in the army, I suggested that we be married in our army uniforms. On our wedding day, I was resplendent in my officer’s wardrobe and expected my future wife, to be dressed in the same manner. Was I surprised when she came down the aisle on the arm of her step‑father in the traditional flowing, white satin wedding gown that all new brides yearn for! The following day we headed back to the poultry farm in Indiana to start our new life together. Our traveling vehicle was the red ‘36 Ford pickup truck that had been stored for 5 years in the chicken house awaiting my return. My new wife had not been discharged from the army yet, so after a few days on the farm, it was necessary for her to depart for Ft. Carson, Colorado to be officially discharged from her military duties. This beautiful and happy marriage of 52 years came to an untimely and unexpected ending on October 16, 1998 when Leona failed to recover from a quadruple by-pass heart operation at St. Elizabeth Hospital in Lafayette. She was loved so much and is missed by so many, especially by her devastated husband. While I was supervising the vegetable farm on Kolombangara in the South Pacific during WWII, my younger brother Ed, back home in Chicago, would send letters asking if I could find some Japanese souvenirs and send them home to him. One Saturday morning when we weren’t working, I decided it was time to satisfy his request. The majority of the natives working on the farm were Seven Day Adventists. At least they claimed they were. Maybe they proposed to be of that faith, just to get out of working on Saturdays. Personally, I thought they were “wicked” meaning they had no religion at all. But anyway, I asked one of the native helpers if anyone knew the trails into the jungle. One of the men (through the interpreter) said that he had lived on the island before the Japanese invasion so he led the way and we went exploring. I had hoped to find an area that hadn’t already been picked over by previous souvenir hunters but we weren’t so lucky. Some one had already beaten us to the best of them and what was left was junk that no one wanted. When we started out into the jungle, I thought there would be only one or two of us but when we assembled, all 16 of the natives came along. They were armed with machetes, hatchets and knives and I had my pistol. There was some doubt amongst the authorities as to the total absence of Japanese on the island so I was glad they all wanted to join the safari. Neither the natives nor I cared to take any chances. We figured there was safety in numbers. We cut across the coconut plantation and headed into the jungle following a Japanese trail. These trails were narrow, single-track walkways and built like a corduroy road using the coconut tree logs when they built the airfield. Because the trails were heavily traveled, they cut the coconut logs into two-foot lengths and laid them side-by-side to make the trail. I guess they did this to keep out of the mud during the rainy season. They must have had a lot of coolie labor available, as there were miles and miles of these corduroy trails through out the jungle. They apparently carried all their supplies and guns by hand as there was no sign of wheeled vehicles being used in these trails. Close to the edges of the jungle however, there were numerous two wheeled, rubber-tired handcarts. They were used to transport 50-gallon steel drums of gas, oil and water. Every half mile or so along the trail were evidences of a Japanese outpost or gun position guarding the route. Close by would be their living quarters. They didn’t have very many conveniences for comfortable living as it looked like they slept on the log floor that had been raised a foot or two off the ground. The huts were built of rough timber posts and logs with either a leaf-thatched or galvanized metal roof. Blankets could be seen rotting on the floor and scraps of mosquito netting were hanging from the ceiling. Here and there, we would find the remains of a decaying kitchen area. The Japs had nothing like our army gasoline stoves for cooking purposes. They improvised their stoves from steel drums cut in half. Inside this stove was a huge iron kettle about two feet in diameter. Wood was used for fuel and neatly stacked over the stove for drying. A few cans of food could be seen scattered about but their main dish was rice. Quite a few cloth bags were lying around bursting with rotting rice. After hiking about 5 miles or so, we came upon a white porcelain bathtub that was probably the luxury of one of the Japanese officers. The men must have had quite a time carrying this heavy, burdensome thing through the narrow twisting jungle trails. The tub also had a hand pump for filling from a nearby stream. I guess they had to take cold-water baths, as there was no sign of a hot water heater anywhere. All in all we hiked about 7 miles that day and due to my easy job, I wasn’t in the best of physical condition. After the first ten minutes on the trail, my shirt was wringing wet and the perspiration kept running down in my eyes. I did find a few souvenirs though, that I sent home to my little brother and I still have them. One was a one-foot section of a 3” bamboo tree that had been used to carry the soldier’s ration of rice. It had a hole bored in the side at one end and closed with a wooden plug. I also have a couple of beat-up Japanese mess kits that had been used to cook rice over a campfire as evidenced by their blackened exterior. I also was able to find a metal helmet I sent home along with my most prized possession¾a Japanese rifle complete with a bayonet and scabbard. I didn’t find this though ¾ it cost me a quart of gin! I traded the booze for the rifle with a Marine back at Munda. 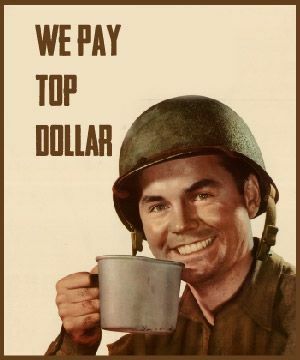 The natives were paid for their farm labor by the British government and soon leaned the value of the American dollar and what it could buy at the Army PX’s. One of the natives had a Japanese warrior’s Rising Sun flag that each soldier carries into battle. The flag was supposed to protect him from harm and was autographed with Japanese characters by his family and neighbors when he went off to war. The purchase price was $5.00 and is another of my prized war relics. Some war-weary American GI’s soon leaned how to capitalize on the late coming troop’s eagerness for Japanese souvenirs. They cut white bed sheets into 2 foot by 3-foot flags and painted a red circle in the middle. Around the outside, they scrawled Japanese language characters they copied from the many boxes laying around the battlefield. Later when these were translated they read, “Fresh Fish” and “40 mm. Artillery Shells”. The gullible latecomers were eager to pay upwards of $25.00 for these supposedly authentic Japanese war flags.